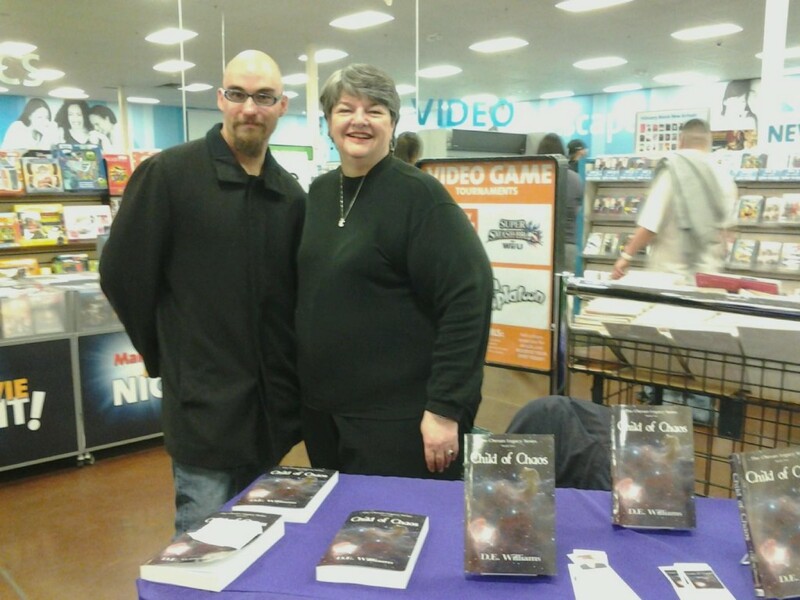 I held my first book signing for Child of Chaos last night – Feb 19th – at the Hastings on Coors & Montano in Albuquerque. Much gratitude and appreciation to Dennis, Candace, Daniel, and the other folks at the store who were so gracious and helpful. 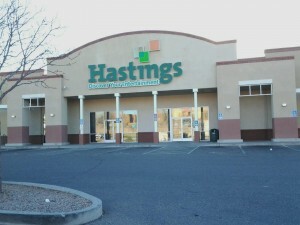 Well-known authors draw hundreds of people to their book signings and one day I may be in that heady atmosphere, but my little world was rocked by the people who came into the store in west Albuquerque last night. 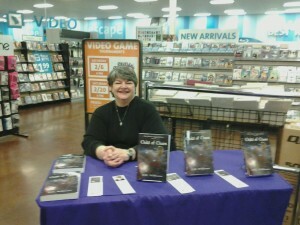 Dozens of people stopped to speak to this first-time author, and so many were encouraging and congratulatory. I had an absolute blast! Of particular fun were the younger people – the little guys coming in wearing their Spiderman and Ninja Turtle tees – who stopped to check out the book. I gave one group of 8-10 year-olds the “elevator pitch” synopsis in a very dramatic voice and they walked away saying “That sounds awesome!” One fourteen-year old dropped by the table a few times to ask how long it took me to write the book and where did I get the idea. He kindly took a picture for me so I could post it on the website. Talking with the high school kids who dropped by in groups was fascinating. Some were only into videos, but they smiled and spoke as they headed past my table. For the ones who stopped, I told them about the book or let them read the back cover in silence. Their faces would light up as we talked about the story. These kids know a good tale when they hear it. I’m encouraged that so many of them said they were readers and enjoyed science fiction. There is hope! I loved that there were young people stopping by with parents, too. It was easy to see how proud the parents were that their children would stop to pick up a book and converse with the author. Good for you, Mom & Dad! Keep them reading. Then there were the hassled college students who had no time for anything but their textbooks – yet they stopped to chat and share words of encouragement. One young man said he read nothing but non-fiction, then he asked about the book and I gave him a bit more than the elevator pitch synopsis. He actually smiled and said that it sounded really interesting. (He seemed sincere!) While he didn’t buy the book, he did take a bookmark with the book’s info and my web address. I hope he decides to read it. Everyone needs a fiction break now and then – otherwise why would some of our recent movies make enough money to clear the national debt? The harried young couples with small children in tow were so nice. They took the time to chat, while corralling the little ones. One couple really wanted the book – even took it to the register, but were a little short on cash. When Dad apologetically brought the book back and said they didn’t have enough for the book and the movies for the kids, I gave him a bookmark with the info and told him if they bought the book at Hastings later to send a message through the website and I would be happy to arrange to meet them at the store and sign it. (I live in the neighborhood and drive by the store everyday.) His smile was huge! I hope I get to meet them again. A special thanks to Chris for letting me entice him into buying a sci-fi book by an unknown author. He dropped the names of some pretty famous sci-fi that he enjoys. I hope he visits the website after he reads the book to let me know what he thinks of Child of Chaos. Some of my wonderful co-workers came to the store to lend support and encouraging words. Two had already purchased the book and made a trip out of their way to say hello and get an autograph. And two bought the book at the store. My developer friend, Matt, even got a picture with me! 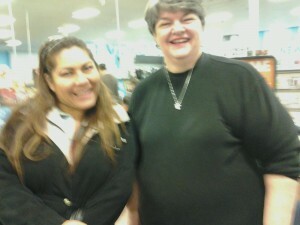 Lisbeth stopped by to chat and had her friend snap this picture for the website. English is a second language for her, but she likes to read books in English. She says she now understands at least 80% of what she reads. You go girl! I have to mention some special readers who purchased books. Let me be clear, Child of Chaos is not graphic in nature, but the heroine is a soldier-assassin and she gets into situations where she has to masquerade as something she isn’t (prostitute and concubine), and there are severe injuries and a couple of bloody encounters with other assassins and attackers. I don’t recommend the book for readers under fifteen years old, not because of vulgarity, but maybe a hope that younger readers won’t grasp the darker side of the Chaos world. All that being said, there was one young reader who stopped by with her Mom and Dad, opened the book and started reading the acknowledgements page aloud. I was so impressed that I snapped a picture of her. I told her parents it might be a little mature for her, but she has read some of the post-apocalyptic fare that is very popular now. Listening to her read, I could tell that she comprehended the words. They bought the book for her and I hope young Maya can discern the true depth of the story – loyalty, friendship, courage, and self-sacrifice. The same for my young friend, Rowan! I didn’t get his picture, but he’s an avid younger reader, too. My last purchaser was a young lady wearing a shirt with pictures of Gigi (the cat from Kiki’s Delivery Service) all over the front. I adore Miyazaki’s films and Gigi’s character was very fun in that movie. It gave us brief moment of camaraderie that I recognized the artwork. 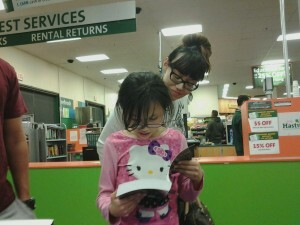 The young lady picked up the book and walked into the store. (I wasn’t supposed to sign them until they were purchased.) I told her that I would wait for her. It was getting late and I had started to pack up everything – being down to my final two books – when I glanced at the register and saw her anxiously looking my way. She brought the book to the table, breathlessly saying that she was afraid I would leave before I signed it. I was so humbled! I know she will enjoy the book and am so glad that I stayed the extra time so I could have one last chat with her.